Come to our Summer Of Snow party! This year’s party will be bigger and better than ever with prizes, children’s activities, freestyle demonstrations and lots of special offers and giveaways! Join us to celebrate the start of the season on the 28th April with a fun, family friendly, snowsports loving party that everyone is invited to! There will be activities for all snowsports fans – new or experienced – taking place throughout the site and lots of special offers from us and our partners too! Win a holiday to Andorra in our annual Snozone Members holiday competition! Join the Snozone Membership to benefit from our best offers, Members Happy Hour and more! Check out our website for full details! Book your pass for Castleford here or Milton Keynes here! Enjoy delicious food from our extensive menu of homemade dishes. Our tasty special for the Summer of Snow party weekend is a tapas menu with 10 options to choose from! Why not treat yourself to a glass of Sangria while you relax? Win a £50 John Lewis voucher! The photo of Castleford and photo of Milton Keynes with the most likes on Facebook, the Snozone Facebook wall or on Instagram will win! Bookings can be made for activities at Castleford here. 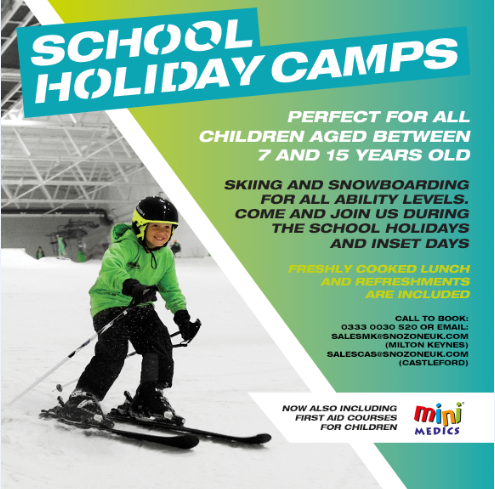 Bookings can be made for activities at Milton Keynes here. Snozone Summer of Snow offers are applicable to new bookings and subject to availability. Book your activity early to avoid missing out. *The winner will be selected at random on 19th September. **We have one £50 John Lewis gift voucher to be won by a Milton Keynes guest and one to be won by a Castleford guest. To be entered into the competition the photo comment must include “#SnozoneSOS”. The photo must be added to Facebook, Instagram or the Snozone Facebook wall on the 28th or 29th April. Like us on Facebook to keep up to date with events, offers and highlights! We are also on Twitter and Instagram! Next Next post: Job opportunities at Snozone!